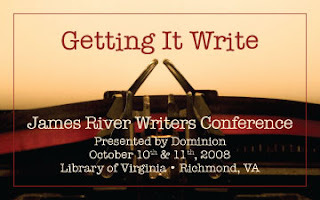 > I attended the James River Writers Conference at the Library of Virginia last year and had fun, plus I learned a fair amount. This year’s conference is October 10-11 and I don’t know yet if I’ll be going–it conflicts with something else I’ve got in the works. But check it out. There are some terrific panel presentations and speakers, and the facilities at LoV are fantastic.